PALM BEACH, Fla. – March 10, 2017 – Barrett-Jackson, The World’s Greatest Collector Car Auctions®, will bring an extraordinary docket of rare, vintage and custom Fords to the 15th Annual Palm Beach Auction, South Florida’s premier automotive lifestyle event, April 6-8, 2017, at the South Florida Fairgrounds. Barrett-Jackson’s Ford-powered docket will include a rare ’69 Ford Mustang Boss (preview), NFL wide receiver Reggie Wayne’s ’67 Ford Mustang Custom GT Fastback (preview), as well as “Kahuna,” a ’47 Ford Custom Woody Wagon (preview). 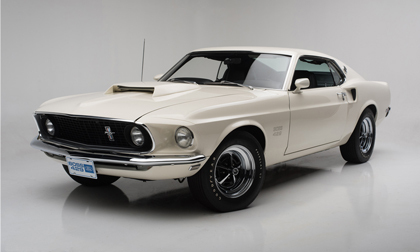 A ’69 Ford Mustang Boss 429 (preview) also known as known as KK #1717 is one of 271 cars made in Wimbledon White and came well-equipped from the factory. Options on this extremely rare Boss Mustang include a Traction-Lok differential, 4-speed close-ratio transmission, power front disc brakes, deluxe interior, functional front spoiler and completion suspension. It features original matching-numbers engine and transmission, which are documented with a Marti Report. The engine received a full rebuild, completed in August 2016, by a Boss 429 specialist in Scottsdale, Arizona, with the entire process being photo-documented. NFL wide receiver Reggie Wayne will auction his ’67 Ford Mustang Custom GT Fastback (preview) at the Barrett-Jackson Palm Beach event. This custom Fastback Mustang is powered by a 545ci V8 electronic fuel-injected engine and features a Tremec T56 6-speed manual transmission. Inside, the custom interior features firm bucket seats that have been covered in fine leather and detailed with polished buttons. The door panels feature classy handles and subtle metal accents above long, sculpted armrests. Classic Ford Mustangs crossing the block in Palm Beach include a ’67 Ford Mustang Fastback (preview), which features thousands of hours of custom work inside and out. It is powered by a 351ci Windsor engine that cranks out 450 horsepower and is mated to a 6-speed manual transmission. The interior of this custom Mustang Fastback features tan, glove leather bucket seats, door panels and steering wheel. Another custom Ford is a ’68 Ford Mustang Custom Fastback (preview),powered by a 428/335ci Cobra Jet V8 engine and 4-speed Toploader manual transmission with Hurst shifter. Its exterior features include 17-inch aluminum wheels, GT-500 badging, billet grille and fuel filler cap, halogen high-intensity driving lights and Cougar sequential taillights. Additional Ford-powered vehicles include a ’47 Ford Custom Woody Wagon (preview) known as “Kahuna.” It features all-original Ford steel and has a 3-inch chop-top built by Doug Carr at Woodn’ Carr. Also headed to Palm Beach is a ’57 Ford Thunderbird “E” Convertible (preview) that has undergone a frame-off restoration. It is loaded with top equipment, including Kelsey Hayes wire wheels, and is powered by a 312ci V8 with an automatic transmission. The 15th Annual Barrett-Jackson Palm Beach Auction will be broadcast on Discovery, Velocity and Velocity Canada during the three-day auction. For specific television schedules, please click here.For more information on becoming a bidder, follow the link to http://www.Barrett-Jackson.com/Bidder/Home. To consign a vehicle for the 2017 Palm Beach Auction, click here.